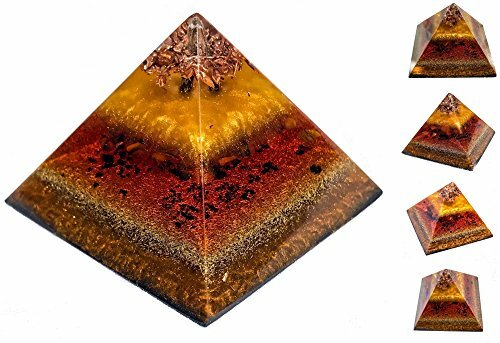 A powerful Orgone energy Pyramid with crystals and healing stones for maximum EMF Protection. Black Kyanite and Shungite are set within five layers of bronze, brass, copper, iron and cast iron. In the middle are natural crystal pieces of tigers eye and smoky quartz for enhanced protection for your physical body from emotional and energetic stress. This orgon pyramid is great to keep in your work area so you stay grounded throughout the day. If you have any questions about this product by Violet Flame Orgone, contact us by completing and submitting the form below. If you are looking for a specif part number, please include it with your message.